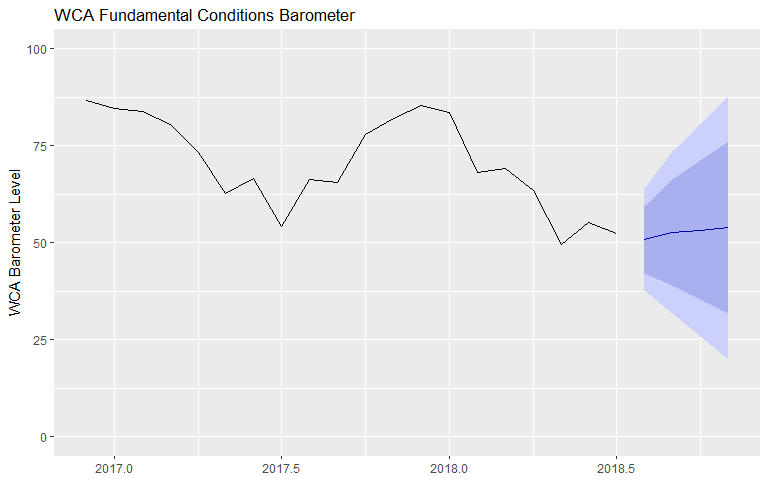 Our WCA Fundamental Conditions Barometer remained stable over the past month (chart A, below). This is a good sign for the economy and markets. Because performance has firmed up, we have stopped cutting equity exposure, and remain tactically tilted toward stocks in Conquest tactical ETF portfolios. If we drill deeper into the barometer, we can get a better understanding of what is going on. The barometer has about one-third weighting in market based indicators of “risk appetite”, one-third on U.S. economic data, and one-third on foreign data. Between April and July, markets performed well in a sign that investors felt good about the future. Trade worries were not enough to overcome positive news about corporate earnings or jobs. After all, S&P 500 company’s profits are up 23% from a year ago, and the unemployment rate (now 3.9%) should soon hit levels not seen since the 1960s. While trends in the United States look relatively healthy, there are a few signs of stress globally. Here are a few examples of what we are seeing. China’s currency has tumbled 10% in value versus the U.S. dollar in just three months. 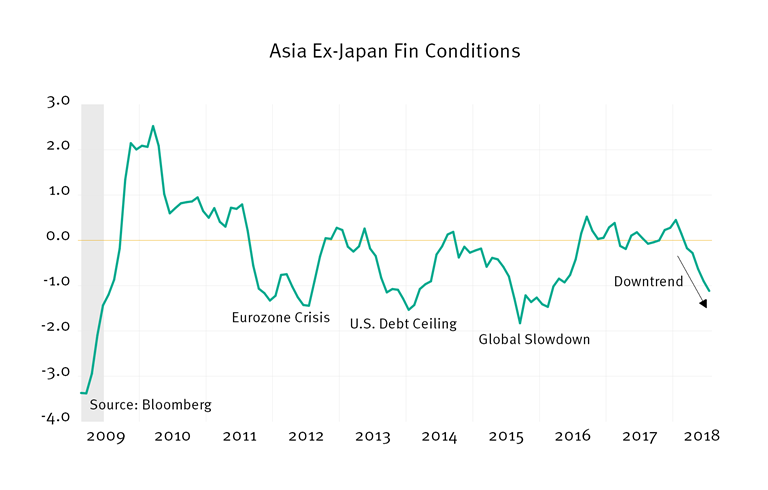 Asian financial conditions are becoming less accommodative, based on a Bloomberg index (Chart B, below) that measures such conditions. 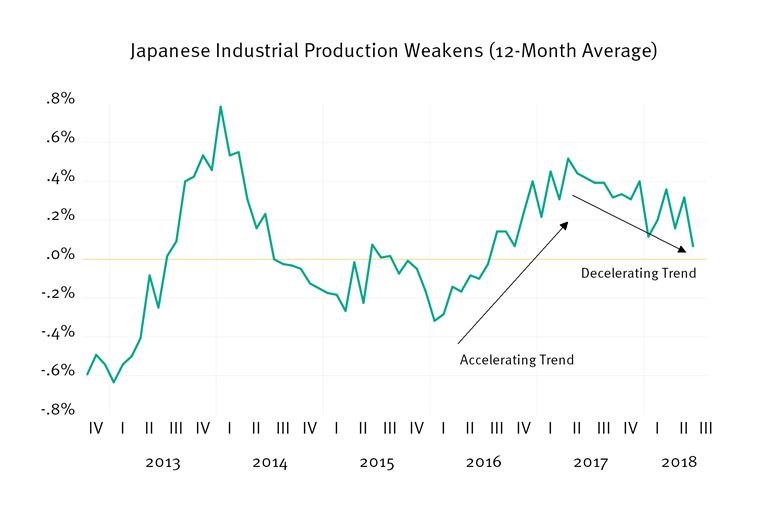 Japan’s rate of industrial production growth has been trending lower for several months. 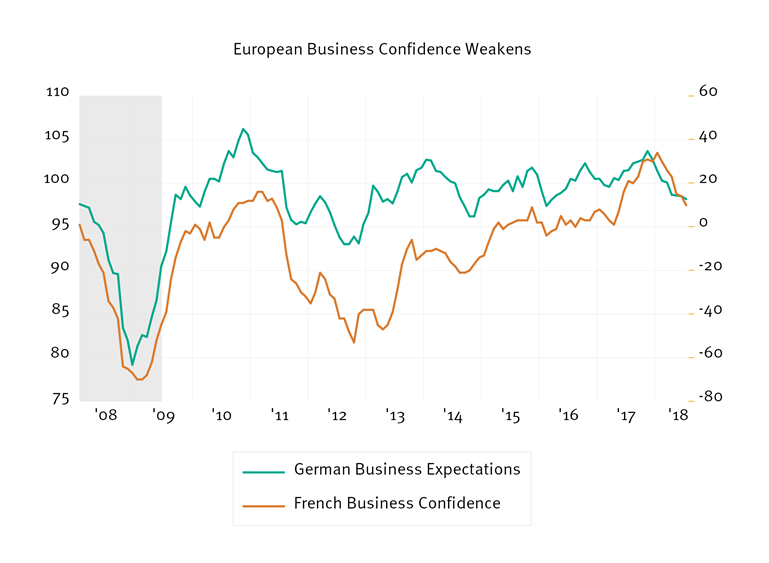 Lastly, business leaders in Europe appear to be reducing their level of expectations for business conditions in the months ahead. As you can see, whatever weakness we see within our WCA Fundamental Conditions Barometer seems to be focused on places outside the United States. This supports our relatively bullish outlook on domestic assets versus foreign assets in Conquest portfolios. Because the most acute stresses seem, for the moment, to be concentrated among rapidly growing emerging markets, we continue to focus on developed markets versus emerging on a tactical basis. This commentary often expresses opinions about the direction of market, investment sector, and other trends. The opinions should not be considered predictions of future results. The information contained in this report is based on sources believed to be reliable, but is not guaranteed and not necessarily complete.